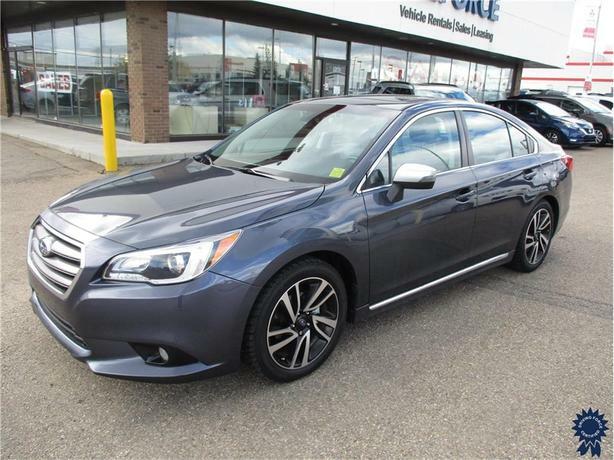 This 2017 Subaru Legacy 5 Passenger All Wheel Drive Sedan comes with a Continuously Variable Transmission (CVT) with manual mode, 18-inch wheels, permanent locking hubs, grey two-tone sport cloth upholstery, light tinted glass, front fog lamps, power windows, two 12V DC power outlets, blind spot detector, lane keeping assist, lane departure warning, backup camera, keyless start, and adaptive cruise control. The 2.5-litre DOHC 16 Valve 4-Cylinder gas engine provides 175 horsepower at 5,800 RPM and 174 lb-ft of torque at 4,000 RPM. Touch base with us to discuss purchasing or financing options that are right for you and experience the difference you will only find at DRIVING FORCE Vehicle Rentals, Sales and Leasing.